The equestrian sport psychology book talked a lot about preparation and visualization, and as a result of following its advice I felt confident as we warmed up instead of feeling like a nervous basket case. My trainer focused more on my teammates than on me in the warmup because Connor was so relaxed and focused on me – big change from last summer. We got lots of 7’s, a few 6’s and two 8’s for our final down centerline/halt/salute, with the most common comment being “stiff through back”. When I got back to the barn, I was greeted with a text from Austen congratulating me on my score of 34 before I even had a chance to check my score! We led the field by 6 points after Dressage. 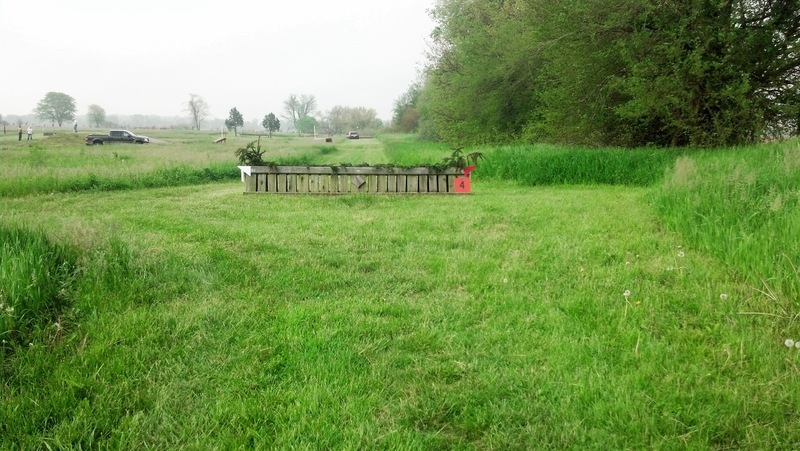 Stadium was two hours after Dressage in a grass ring, and the jumps were all quite wide, and were mostly intricate standards with poles and flowers underneath. 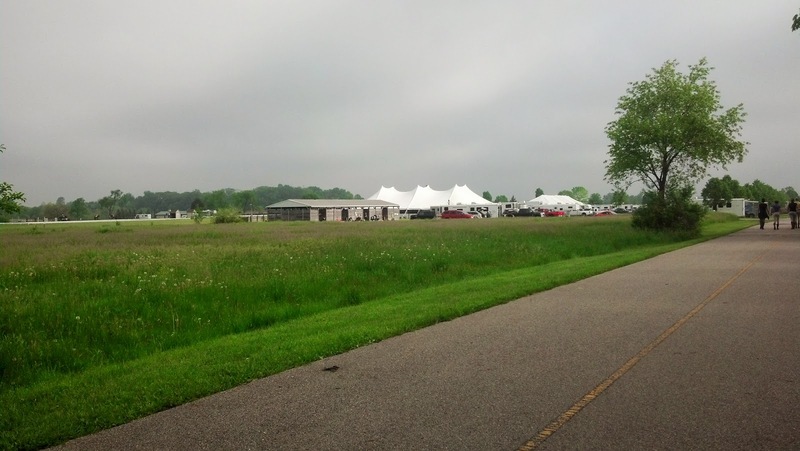 Like with Dressage, I was so mentally well-prepared for it that any nervousness I felt was fear of the unknown – how Connor would react to doing stadium on grass over strange fences, jumping flowers for the first time, right next to the tent stabling. 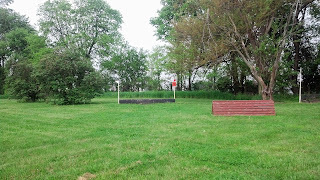 In our warmup, I started to get a feel for the level of confidence he required from me, and we had a couple of good fences toward the end of the warmup. After our stadium round, the barn moms told me that it looked like he just needed to put his nose down and check out each fence before going over them. He swerved before the first fence, causing me to lose my stirrup, but went over it without a refusal, and though our approach was…green…to every fence, we made it through clear, primarily because the only thing in my brain was “Cowboy up!” He’s a green pony and this ain’t hunters, it doesn’t have to be pretty! 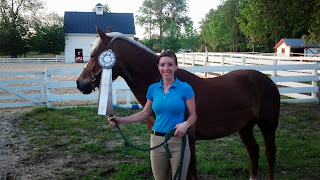 All I needed was for him to come out of the ring feeling accomplished and proud of himself, and to not be scared, and we did that – as well as going clear, thanks to his scopey, athletic jump even from a near standstill. 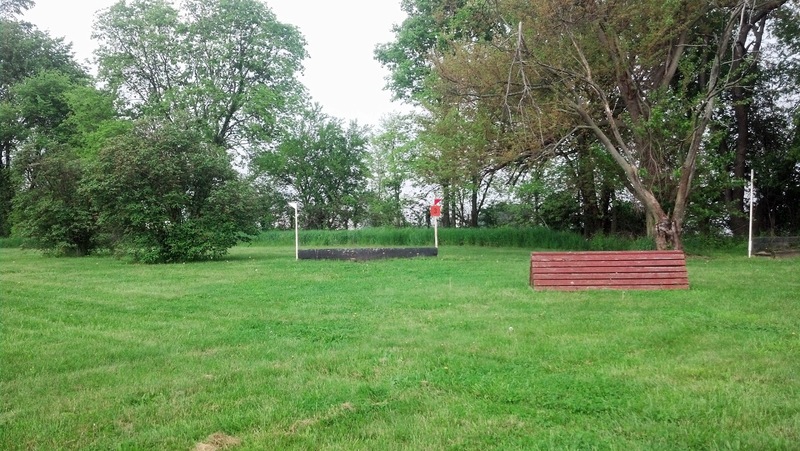 As for me, the photos show that my stirrups are finally short enough, and I only jumped ahead of him at two fences. XC was the biggest unknown of the weekend for both of us. The course started out with an easy log, but got progressively harder from there. Fence photos are at the end of the post for reference. 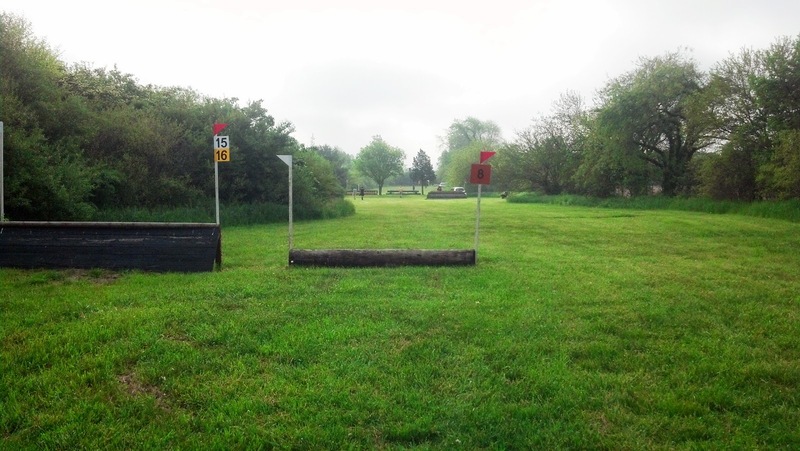 Fence 2 was a ridiculously skinny log right next to a huge prelim fence, and that’s where we had our one and only runout. We circled back and he popped it the second time with lots of encouragement from me. From there it was an uphill canter to a taller log, then a long canter to the bogey fence, the first non-log, a feeder with evergreens on top. Not only did it look funny, there was a nice, wide inviting path mowed on either side of it for the other divisions, and it was the only fence on course to not have flag poles on either side, just flags stapled to the fence itself. I was not surprised when he stopped dead at it, but I also knew that if he took a single step backward we would be last in our division, so I urged him on – and he jumped it from a standstill! Good pony! I ended up on his neck, and one of his back hooves hit it as we came down on the other side, but he was fine and I quickly regained my seat and we cantered away. It was like that fence was the turning point in our Disney movie, because after that, I knew what level of commitment and confidence he needed from my ride, and he knew that he could get over anything I asked, even from a standstill. 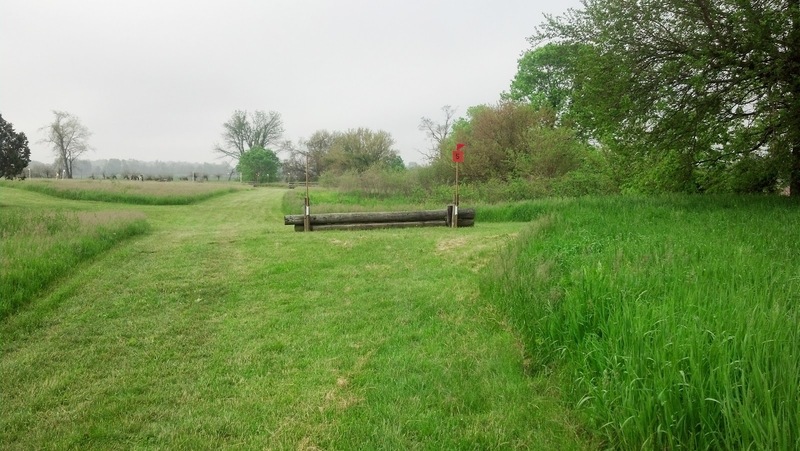 Fence 5 was a pile of downhill logs, and with a swerve at the fence judge, he took it like a champ. At the fence 6 coop and the fence 7 red ramp, he locked on and gave me just the spot I asked for. After the final jump, another log, we had about a 150m canter to the finish, and we went through the flags with ears up and eyes bright, still cantering. I jumped off of him as quickly as possible, loosened his girth, gave him a big, sweaty hug and walked the quarter mile through the woods back to the barn next to him. His job was done and we were both so happy! I missed Fences 1 and 2. This is Fence 3, at the top of the hill. 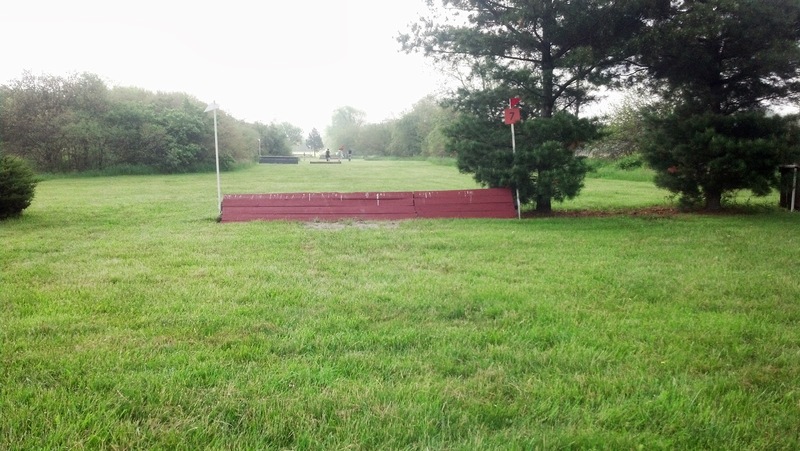 Fence 4, the one he jumped from a standstill. Look how inviting that is to go around! Fence 5, on a slight downhill. There was a truck parked next to it that he swerved at. 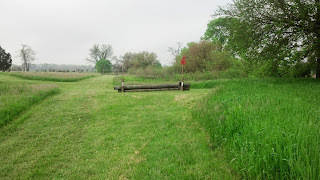 Fence 8 "Finish pole", and the finish flags way in the distance. Bravo, Jen. Congratulations. Sounds like you rode smart. Barry and I had one those jump from a stand still fences our first away show. it gets the job done. Congratulations! It must feel so good to have the very first event behind you. I love your pictures! Congrats! What a great feeling to finish and the pretty ribbon is a bonus! 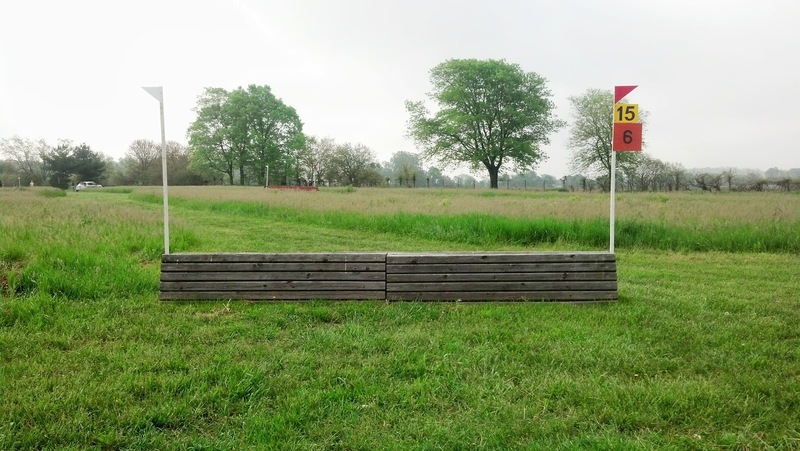 Make sure you check USEA rules for future reference. I have jump judged a lot but its been awhile, and I am pretty sure you are not allowed to jump a jump of any height from a standstill. Just check to make sure, it couldn't hurt to know one way or the other! Congrats! Way to go, super pony! Yes to Heidi's comment -- jumping a fence with height from a genuine planted-feet standstill is legally a refusal and I have seen it assessed with a DR penalty. Congrats on a successful go! YEAH!!! Congrats to you. What an awesome weekend! :) Coming home with a ribbon just makes it better. Proud of you both!!! Congrats and love you guys!! !